Interview: Broods on their debut album, 'Evergreen'. 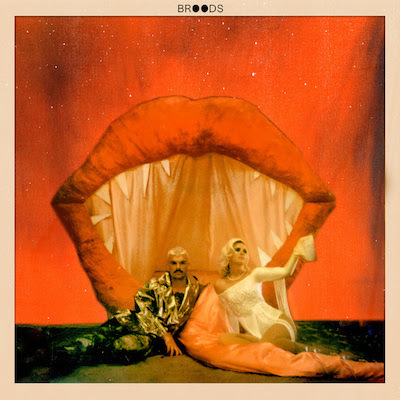 Broods - consisting of brother and sister, Caleb and Georgia Nott - are one of New Zealand’s hardest-working musical exports. The duo first uploaded their debut single 'Bridges' onto Soundcloud back in October of last year and now over 1.9 million streams (on that one song) later, they’ve made a name for themselves touring internationally with the likes of Ellie Goulding, Haim, Chvrches and MØ - with Sam Smith support dates coming up later this month. The Nelson-born siblings share a resolute commitment to an industrious work ethic, vowing never to take any of their success for granted. The elder of the two, Caleb says: "We keep active and work on Broods 24/7. This what we do now. It's our life." And all of that hard work recently paid off, when the band beat the likes of Ariana Grande to #1 on the official New Zealand charts with their debut album, 'Evergreen'. "We need to put everything into this because if it ever falls apart, it won't be because we didn't try..."
COUP DE MAIN: What was it about your song 'Evergreen' that made you want to name the album after it? BROODS - GEORGIA NOTT: The song 'Evergreen' is basically about how beautiful life can be. It's about being infinite and indestructible as a soul. Nobody can touch that unless you let them, so it's quite a relevant theme running through our lives right now. It seemed like a good track to name the album after. CDM: Your album seems to be quite reflective of your nomadic touring-schedule since the band launched overseas and all of your daily adventures that you two have, has that really shaped what it’s been like growing up over the last year? BROODS: We've definitely had to grow up a lot quicker than most 20-22 year olds. We don't really drink on the road. We eat really healthy and sleep well. It's not very 'rock star' but the thought of being off our game for a show or an interview because we haven't been taking good enough care of ourselves is absolutely terrifying for us. CDM: In 'L.A.F. ', Georgia when you sing "Wannabe on repeat" - is that a Spice Girls reference? BROODS: Haha! Indeed it is a reference to the Spice Girls! I had an amazing group of very loyal friends and we used to play this song while we got ready for girls’ night. BROODS: We like to experiment with different processes so we keep challenging ourselves. It's easy to get into an easy routine but the problem with that is you can tend to write the same song over and over again. We want to be forever evolving. BROODS: A great song is something that you go back to in twenty years and it's still so influential to you. It's up to the listener I guess. Songs hold different memories for different people and the great ones are the ones that become a part of you and your story. CDM: One of the things I really respect about you two is that you’re super hard-working. Why is a strong work ethic so important to you? BROODS: We wouldn't get anywhere if we sat on our arses all day. I've been through that and it's not fun or satisfying. We need to put everything into this because if it ever falls apart, it won't be because we didn't try. CDM: What’s the most important lesson that Joel Little has taught you? BROODS: Probably just to remain humble and focused on why we do what we do. The moment we forget why we started this will be a sad day. CDM: If home is where the heart is, where do you consider to be 'home'? BROODS: Nelson. It's where our parents are and our sisters are. It's where we had the most amazing upbringing. It's a beautiful place to call home and go back to when we need to get away from it all. CDM: What’s the best way to build a fort? BROODS: We used to take every cushion in the house and stuff them under the table with games and snacks and then close it in with bed-sheets. CDM: If Vin Diesel were to star in a Broods music video, which song would it be for and what would happen? BROODS: There's a video on YouTube of him singing 'Stay' in a dark room. It's funny when you think about it, but it's actually really beautiful how into it he gets. So, I think one of the more emotional songs like 'Killing You'. Broods’ debut album 'Evergreen' is out now - featuring the singles, 'Bridges', 'Never Gonna Change' and 'Mother & Father'. Click HERE to purchase now via iTunes.